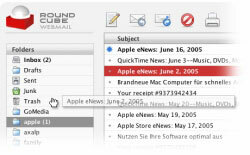 I'm a big fan of RoundCube, the open source imap webmail client. While still in beta and lacking some features, it's free, licensed under the GPL, easily customized look due to reliance on CSS for styling, works great for basic email and is definitely one of the sexiest webmail clients out there. One issue that had been bugging me is that it wouldn't search for Recipient (To) by default. Only for Sender (From) or Subject. That's it! Gotta love open source.